Nestled along the Dolores River, near the sleepy town by the same name, lies the Dolores River Campground. Whether you need a place to pitch your tent, park your RV or just lay your head, this family-run campground is the place to stay on your way to Mesa Verde National Park. Owners Bill and Lainey Beyhan were tired of the 9-5 life in 2013 and found the campground for sale online. They purchased it and, along with their children, fixed it up and put their own stamp on it. When you pull in, it’s obvious that the Dolores River Campground is a place where all are welcome. When you check in, you can explore the campground store, filled with handmade goods. Children play on the playground in the center of the sprawling complex, or try their hand at casting a line in the fishing hole between the campground and the river. If you don’t have a tent or an RV, the campground offers several options of accommodations. You can stay in a full-service cabin, a camping cabin or a yurt if you’re looking for normal walls. If you feel like branching out, reserve one of their vintage trailers, or even a covered wagon to spend the night in. The 1953 Airstream was a brand-new addition for the Beyhans for the 2017 season. Dubbed the “Flying Cloud”, Lainey and her father restored this classic trailer to give guests a time machine experience. When you step inside, you’ll feel as if you’ve been transported from the curtains to the microwave. This cozy trailer sleeps two and has its own half bath. Retro Restaurants in Cortez, Colo.
After a shower in the clean and spacious communal bathrooms, head down the highway towards one of Colorado’s most historic national parks and the largest archaeological preserve in the U.S: Mesa Verde National Park. Before you go too much further in time, though, stick with the 1950s theme and grab coffee at the Silver Bean in Cortez (www.facebook.com/thesilverbean), another vintage Airstream. Order your coffee inside and enjoy it on the patio, or drive-through if you’re in a hurry to get to the park. When lunchtime rolls around, check out the Burger Boy in Cortez (www.burgerboydrivein.com). This classic drive-in serves up burgers, fries, milkshakes and more. Place your order with the car-hop, who sports slicked back hair and a tie-dyed shirt, sit back and relax! 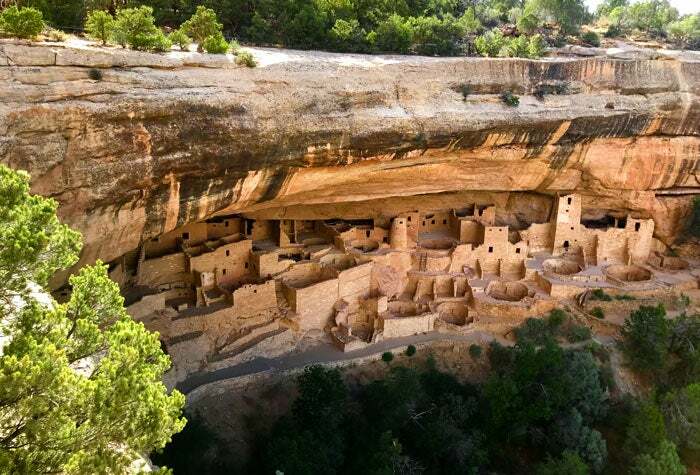 When you’re ready to leave the 1950s behind you, head back even farther in time to the 1200s while exploring Mesa Verde National Park.